Sunday night was a big one for Keifer Thompson. At this year’s SESAC banquet (Nov. 3), he carted off the organization’s Country Songwriter of the Year award, performed the delightfully sprightly “Everything I Shouldn’t Be Thinking About” as half of Thompson Square and won an award for co-writing “If I Didn’t Have You.” Plus, Magic Mustang, which represents him, was named Country Publisher of the Year. The Country Song of the Year was “Cruise,” co-penned by SESAC-affiliated tunesmith Jesse Rice. This country-pop smash sung by Florida Georgia Line was at No. 1 longer than any other country hit during this past year. Jon Stone picked up a SESAC award for “A Woman Like You,” as did Monty Powell for “For You.” Kim Tribble won for “Let There Be Cowgirls.” John Davidson & Jacob Bryant were honored for “Done.” John & Jacob, as they are billed as performers, also sang their award winner. 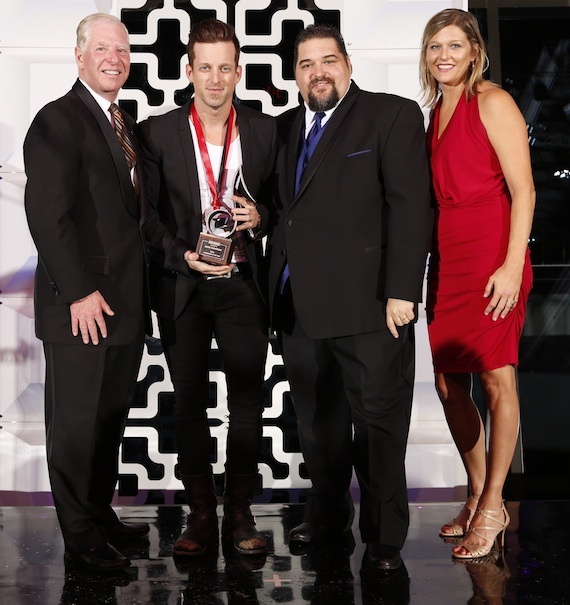 SESAC remains the only performance rights organization that gives out awards for songwriting success in the Americana field. Among those at the banquet who collected Americana statuettes from presenter Dennis Lord were Tammy Rogers, Lynn Langham, Cary Barlowe, Chris Coleman, Robby Hecht and Thomm Jutz. Winners who weren’t present included Mumford & Sons, Bob Dylan, Corb Lund, Hays Carll, The Avett Brothers and Jim Lauderdale. The awards banquet, which kicked off Country Music Week, pulled off the tricky vibe of being elegantly refined yet warmly relaxed. It was staged at the stunning new Country Music Hall of Fame Event Hall. “I can’t think of a more appropriate location for our banquet,” added Tim Fink. He presented most of the country awards with assistance from Shannon Hatch and John Mullins. Gary Burr & Georgia Middleman, Linda Davis & Lang Scott, Rick & Janis Carnes, The Roys, Paul Overstreet, Iodine, Craig Campbell and Webb Wilder were among the headliners mingling. Kathy Mattea and Jon Vezner both added glamor to the eve, he in a vintage wool Scottish three-piece suit and she in a blue velvet evening coat. Velvet was definitely a couture theme of the gala. Erika Wollam-Nichols was in a vintage black velvet evening dress with a pearl necklace. Victoria Shaw wore a black velvet coat embellished by gold embroidery. Fats Kaplan had Kristi Rose on his arm, she in a black velvet Chinese jacket with a red silk lining, with the added pizzazz of evening gloves. Carla Wallace chose a white crocheted floor-length coat. Laura Heatherly sported a slim-cut black pants suit. Anna Wilson had on a figure-hugging white sheath with blue filigrees on its flanks. The Grascals’ Jamie Johnson reported that the band has the new American Pickers TV theme song. Dan Hays bore tidings that an ultra rare concert by K.T. Oslin at his Franklin Theatre on Nov. 15 has been sold out for weeks. Working the room were Bob Doyle, Mike Doyle, Ken Paulson, Dave Paulson, Billy Block, Bill Mayne, Kent Earls, Ken Robold, Troy Tomlinson, Gilles Godard, Scott Siman, David & Susana Ross and Susan Stewart. The banquet not only looked fabulous in its new venue. It tasted it, too. The first course was slivers of golden beets topped with baby arugula and boursin cheese in a lemon-oregano vinaigrette. The main course was cognac beef au jus, plus macadamia-nut encrusted trout filet with a tequila-rosemary white sauce. Roasted fingerling potatoes, small scoops of spaghetti squash and grilled asparagus bunches tied with carrot strips rounded out the presentation. Dessert was zinfandel-poached pears with vanilla icing. The 500 schmoozing fabulons included Frank Liddell, Pat Higdon, Pat McMakin, Sarah Trahern, Gary Overton, Ben Vaughn, Bart Herbison, Bo Thomas, Rep. Marsha Blackburn, Lori Badgett, Rod Essig, Ree Guyer Buchanan, Randall Himes, Drew Alexander, Alan Kates, Woody Bomar, Charlie Monk, Phyllis Stark, Diane Blagman, Paul Barnabee, Jed Hilly, Holly Bell, Karen Clark and Sam Tate. “We are honored to be part of your lives and careers,” said Dennis Lord. I feel exactly the same way about this precious songwriting community.